A digital security health check-up for your computer. Stethoscope helps you check and configure best-practices security settings on your home or work computer. An easy security health-check for your computer. Sign up for important Stethoscope announcements. Stethoscope is a downloadable app for Windows and Mac that helps you make sure you have good security settings enabled on your computer. 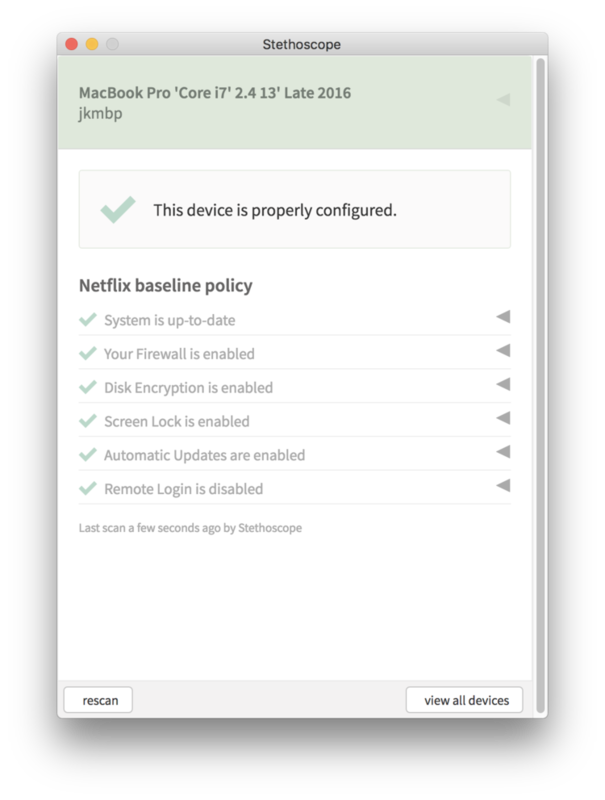 The app is an Open Source project from the Netflix security team. Ragtag is making it available for you! Will it make me secure? Not on its own, it won’t. Stethoscope is a simple and easy way for you to make sure you are implementing best practices for security settings on your computer. It’s essentially an automated checklist, that then walks you through how to make sure you can check everything off. You will still need to make sure you keep your security settings enabled, as well as follow digital security best practices beyond your security settings. But Stethoscope makes that first step so much easier. When you run the Stethoscope app on your computer, it checks your security settings, such as disk encryption, firewall, automatic updates enabled, etc. The app will then show you a report which tells you which recommended settings you have already enabled, and which ones you should enable. If you need help with any of the recommended security settings the Stethoscope app will walk you through how to do it on your particular computer. What’s Ragtag got to do with it? The open source project has all the code you need to compile the app yourself, digitally sign the app, and distribute it. Sounds fun, right? Ragtag has done that for you, you can download it and go, no muss and no fuss. What data does Stethoscope report back to Ragtag? How can I learn more about the project, and the philosophy and security behind it? Take a look at the Netflix Github repo for Stethoscope-app here.